Watch for My Authentic Food on Tour!! At My Authentic Food we have been out showcasing Seven Secret Ingredients for Caribbean Cooking in Canada right now. We are looking forward to a full class at Kootenay Coop in May, 2019 as we show these Canadian Rocky Mountain people how to build flavor into food. Then My Authentic Food will be in the British Virgin Islands with Caribbean Mountain Coffee assisting with the distribution channels to bring coffee from the islands to the world. The Little Lucian is on tour! Conferences, retreats, cruises....the world is the limit! Things are ever-changing with The Little Lucian cooking school!! For now our Bricks and Mortar location for cooking classes on the beautiful island of Saint Lucia will take on a hiatus. Sorry to disappoint you if you wanted to book a cooking class right now. Please watch here for class dates in the future. The Little Lucian is coming out in an exciting new way! Watch for The Little Lucian on Tour!! Myself and my Caribbean cooking colleague Chef Freda Gore and friends are booking ourselves into retreats, women’s conferences and festivals to showcase the Seven Secret Ingredients for Caribbean Cooking and to invite you to a Caribbean Culinary Cruise!! December 16-23rd 2018. Would you like us to come to your group to speak? Or would you like more information about our next event and the cruise? More info and videos to come. 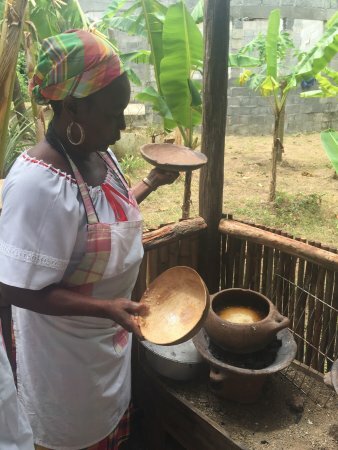 Learn the techniques that build authentic Caribbean flavor.